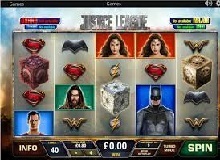 Justice League is a 5-reel, 40-payline video game powered by Playtech for action-packed movie lovers. As the name suggests, it is evident that there are more action and drama for a player to enjoy. Besides, who wouldn’t want to indulge in a game with renowned characters who are ready to offer free spins, and four progressive jackpots to be won? Still surprised? Well, after reading this article, you will continue to wonder why such a game came up with such offers. It perfectly normal to watch a movie whose characters are popular. What’s even better is having these stars at your disposal because they need you as their colleague and obey the rules. 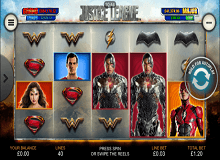 As you play Justice League slot machine online, you will meet renowned stars such as Ben Affleck, Gal Gadot, and Jason Momoa. If you an ardent fan of blockbuster movies, you must have taken note of Batman and Wonder woman who teams up with Flash, Aquaman, and Cyborg to destroy Steppenwolf and his battalion of Parademons. Interestingly, the video game was created on the same day the film premiered. 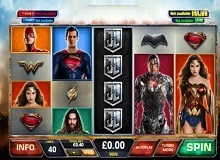 Like most casinos online, Justice League game offers you the opportunity to wager for free or real money depending on your current situation. Begin the game by adjusting the coin sizes; the minimum being 0.01 and 50 as the maximum bet per play line. Use a minimum bet of 0.4 while the maximum should be at 2,000 coins. If you are ready to play, switch to the Autoplay button to enjoy unlimited whirling experience. Now, sit back and become a proud winner of re-spin features, wilds, and special bonuses awarded by each superhero. Batman is the highest paying symbol rewarding up to 500 coins. You have the option to use the two free spins you have been offered even as another superhero appears on the reels to turn into wild icons. Superman rewards 400 coins. This character can turn all symbols into wilds. Wonder woman pays up to 300 coins and seven free games. Any character appearing thereafter will turn all other versions into wilds. Cyborg allows you to play alongside dozen free spins. If the whirl doesn’t trigger the bonus round feature, you will be shifted to another screen. When Aquaman appears, you win ten free spins. Any icon appearing after the spins will turn others into wilds. Three flash icons reward only seven coins. Nonetheless, it offers the freest play, but has very little influence. Still, any hero appearing thereafter will be turned into a wild. The progressive jackpot mechanism offers players the opportunity to win numerous prizes along with randomly triggered special features activated after any swirl. Moreover, you can get randomly get a re-spin. At this point, any hero appearing after the swirls will turn into a wild. During the gameplay, you are likely to qualify for a Superhero re-spin as each superhero turns into a wild. As a gambler, you can keep trying until the entire team turns into wilds. Even more, each hero can trigger the bonus. The Wonder Woman, in particular, will offer you seven free spins as other heroes landing on the feature turn into wilds. That’s not all. Anytime you land a combination of three or more scatters, you will win up to 14 free spins. Superman bonus is activated using five free spins, with a fantastic way of increasing your odds. For Batman’s feature, you can only hope to game using two free spins. However, its stacked wilds will offer more rewards. Basically, you can trigger the feature five times thanks to many triggers. Be the Hero No One Talks About! If you have fancied being on the silver screen, here is the chance to showcase your skills. The heroes are already popular, but they need you to help fight their enemies. 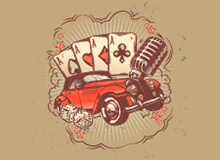 If all goes well, you will be rewarded with lots of prizes including free spins, wilds, and a progressive jackpot amount. Despite its unknown RTP, Most critics can agree with the fact that this slot is doing great even though it was only released last year. Through it, more people will do anything to watch the movie once the game has been released.